This product is a high quality cable to allow you to connect your Bang and Olufsen Beolink Active or Beolink Passive extension room box to the corresponding Infra Red Remote Eye (not included with this cable). The cable is finished in white and has a fitted 7 pin DIN plug at one end for connection to the Beolink Active/Passive box. The other end is bare wire, ready for you to terminate in the Beolink Remote Eye using the screw terminals in the back of the remote eye. This cable comes with full wiring instructions - if you are in any doubt, please ask! 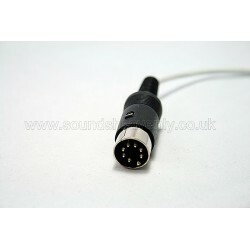 This cable is now also available packed on a 100 metre reel, with unterminated ends (ie. with no plugs fitted), for use when planning your home B&O installation. As this cable comes without fitted plugs, we would only recommend this option for customers who have access to skilled engineers (to solder the plugs onto the cable once it has been installed). We provide wiring charts with each reel of cable to assist you with your installation.